Unfortunatly last year’s event had to be cancelled but is back this year to offer you another fantastic day out for chilli lovers everywhere! But this year, it’s gonna be bigger, better and hotter!! We have stalls and entertainment stretching from Broad Street to Market Place to the Town Hall Square!! The cream of the UK chilli industry as well as local artisan companies will be offering a glorious array of products from around the world, from chilli sauces to chutneys, seeds and plants, spices and even chilli beer and cider! With over 40 chilli and non chilli stalls there is sure to be something for everyone! This year, we will be bringing you some of the best street food in the UK today, from East Asian to South African cuisine, to amazing low and slow BBQ, delicious Mexican, amazing wings and hot dogs and some truly scrumptious vegetarian fare, all located in the main entertainment zone in Market Place. The main stage in Market Place will once again feature some of the best local bands and artists playing throughout the day for your pleasure, interspersed with the now legendary Man v Food and chilli eating competitions!! This year we will be featuring the Reading Chilli Festival chilli sauce competition! Chilli companies attending on the day will submit their best mild, medium and hot chilli sauces for you to judge! And finally, we are proud to be hosting the 6th Reading Chilli Cook-off! Teams will battle for 4 hours to produce this best chilli con carne or veggie chilli which will be judged by officials from the UK Chilli Cook-off Association. 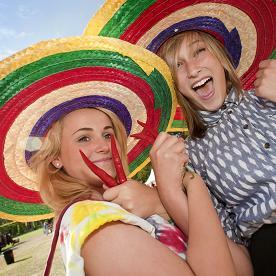 West Dean’s Chilli Fiesta is now one of the UK’s largest and most popular Chilli Events in the UK. Chilli Fiesta is an annual event in which West Dean dedicates itself to three days of chilli madness. We lay on the entertainment, food and lots for you to do and discover while you provide the enthusiasm for all things Hot! Hot! Hot! ‘For a fraction of the cost of Glastonbury or Glyndebourne, spice-loving punters can stay for three days of capsicum carnage’, Daily Telegraph. Make a weekend of it and camp in the fabulous grounds of the West Dean Estate, near Chichester. Full camping facilities are available throughout the weekend with a limited number of pitches so don’t take too long to decide. The campsite will be divided into family friendly, lively (for the night owls amongst us), stall holders, camper vans and caravans. You can watch food demos, sample some delicious delights and there will be plenty of food stalls around to ensure your hunger pangs are kept at bay as well as three bars on site offering a selection of beverages. To give a real party atmosphere to the weekend there will be live music from midday until 11pm each day across two stages. With over 140 stalls, there’ll be great variety of quirky gifts on offer as well as chilli foods, chilli plants, seeds and produce. A special Children’s area has been created which will include Vintage fun fair rides, Punch and Judy and face painting. (there’ll be a small charge for the fun fair rides). And of course, don’t forget the stars of the show and the reason why West Dean has become a magnet for all things chilli and don’t forget to visit the Glasshouses in the Walled Gardens which will be brimming with over 250 varieties of chilli.